“As far as the facility itself, at its peak it will generate enough energy to run the campus,” Campus President Bill Hitesman said. “Everything we get back from Hastings Utilities will be clean energy.” Construction started on the project in October and finished a couple weeks ago. 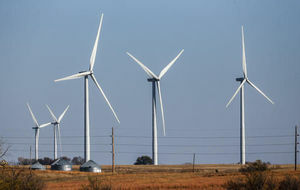 The turbine was online as of Dec. 23 and is now sending power to the Hastings Utilities grid. Hitesman said CCC is in process of putting together a wind energy curriculum. Read more. This entry was posted in Green Campuses, Nebraska / Midwest News, NewsBlog and tagged Bluestem Energy Solutions, CCC's Wind Energy Program, Central Community College, Central Community College's Wind Energy Program, Hastings Utilities on January 8, 2017 by Helen Deffenbacher. 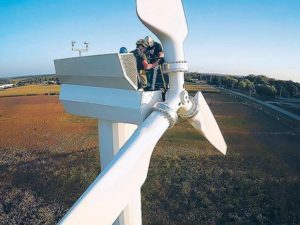 The Saline County Wind Association (SCWA) Inc. has voted to enter into negotiations on a wind lease agreement with APEX Clean Energy of Charlottesville, Virginia. 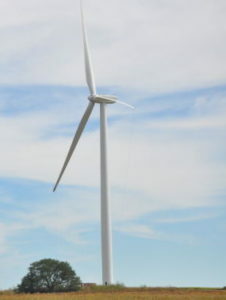 APEX has indicated it plans to build a 300 megawatt wind energy facility in the following townships of Saline and Fillmore counties: Atlanta, Olive, Turkey Creek, Belle Prairie, Chelsea, Franklin and Glengary. APEX has renewable energy projects in 25 states, most of those projects being wind energy facilities. This will be their first project in Nebraska. Click to continue reading. Fillmore County is about 120 miles from Omaha, with a population of approximately 5600 according to the latest census. Geneva is the county seat. 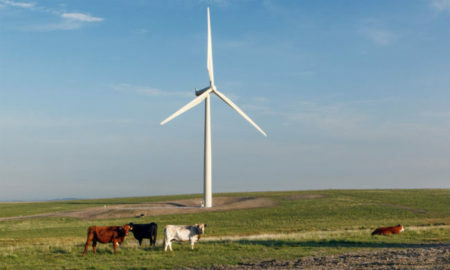 This entry was posted in Nebraska / Midwest News, NewsBlog and tagged APEX, Bluestem Energy Solutions, Midwest renewable energy development, News Channel Nebraska, Saline County Wind Association, Seward County Independent, The Sentinel on August 12, 2016 by Helen Deffenbacher.